Then his healing journey began. He was taken to the vet, shaved, vaccinated, X-rayed, and crated for transportation to the kennels. All the while, Nemo was brave, curious, gentle, grateful, and fearless. 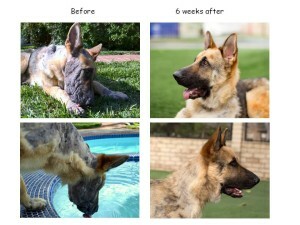 He needed medicated baths for months. They were long and painful, and there was scrubbing and bleeding. But all the while he seemed to know that everything we did was to help him on his road to recovery. A foster stepped up to continue his arduous care routine, and after months, Nemo began to gradually respond. He gained weight, his front leg healed, and his fur filled in. He morphed into a stunning, regal black and tan shepherd who was far younger than we originally expected. Nemo was a relatively laid-back dog. He spent his days in his foster home going for walks, fetching tennis balls, and playing with other dogs. But he also loved just “chilling” in the backyard or sitting with the humans to watch television, even seeming to enjoy the family pastime of watching football games. Nemo often went with his foster mom to visit other rescue dogs who lived at the kennel, watching while his mom tended to them. He looked on from afar, happy and relaxed in a long run, observing the activity as kenneled dogs came and went on their walks. Once he fully recovered, Nemo morphed into a strong and powerful and protective shepherd. And we knew he would need a structured and disciplined environment with another well-settled dog in the home to be a role model. So we all hoped that we could manifest the right home for him. In his foster home, we learned he was housebroken, had good house manners, was friendly with other dogs, and was respectful of boundaries. He knew basic commands and had a genuine desire to please. Most likely, he had once been loved and well-cared-for before he found himself alone as a stray. A few weeks ago, Nemo was invited to stay with the mother and father-in-law of one of our volunteers and their resident canines. They were looking for a very special dog: a German Shepherd Dog with excellent temperament; a dog who would be dog-, cat-, and bird-friendly; a dog who would be gentle with kids and responsive to all family members and friends. The lucky dog would have more than an acre of fenced grass yard on which to run and play with all the doggie friends, a swimming pool in which to cool off, and, of course, love and attention from many dog lovers. Nemo moved in and settled beautifully, every puzzle piece fitting perfectly together, as though it was meant to be. They found Nemo, and Nemo found his home. And while we’ll never know the full extent of the tragedy and hardship Nemo endured, we can sleep peacefully now, knowing that our regal Nemo is no longer lost in a sea of unwanted dogs looking for his forever home. He is now thriving and languishing in the love and care he needs, deserves, and welcomes. When I asked him to describe his new home he said simply: Paradise. My home is paradise. This entry was posted in Heartwarming Rescue Stories and tagged animal lovers, dog rescue, dogs, heartwarming dog stories. Bookmark the permalink. To raise money for animal rescues and animal charities; To educate others about the plight of homeless animals; To raise awareness about the fight for animal rights and safety.